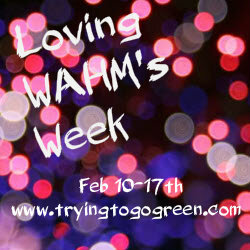 Another great WAHM is Cynthia and she is the owner of Sew Handmade. She is the mom of 3 little boys and makes a great variety of products. She is also a local mom to me and I was very excited to meet her in person! She also works with her cousin Kelly and she is a mother of 2. Today I will be showing you a wet bag and cloth wipes. First I will show you her cloth wipes you will immediately know why I am loving them. OWLS!! She gave me a dozen cloth wipes and how cute are they. For a dozen they retail for $9.00 or in singles they are $.75 for in stock material. They are made with 3 layers of flannel and they are super soft. Next is a wet bag. Small size 12x12 is $12. Medium 15x16 is $15 Large 20x22 $20. I love this rainbow chevron print. Her wet bags are totally customizable and she has a ton of prints to choose from. This is a small wet bag but I can still fit a ton of diapers in it. This bag has a fabric outside with a hidden layer of pul on the inside. The zipper is huge and I like that. I love them all she does great work and my expectations were met and beyond. Like I said before she makes other items as well. 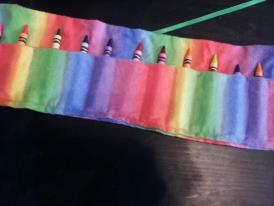 One lucky TTGG follower will be winning one of her Crayon rolls. Their will be a choice of 2 girl or 2 boy fabrics. Love her wet bags and taggy blankets. I looove the wet bags! Saw a peace sign one I really like. I like the wet bags!! I love the idea of the crayon holders, but would probably choose a wet bag!